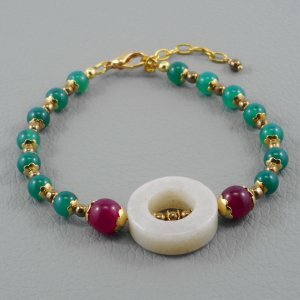 The large Mustang Jasper beads in this bracelet are smooth with a well-polished lustre finish. Brushed copper saucer-shaped spacers add contrast to the 10mm Mustang Jasper with its dark, smoky base and flashes of red. The copper is repeated in the clasp and findings including wire guardians and crimp covers. This is a large bracelet and will fit a 20cm wrist.